“U.S. 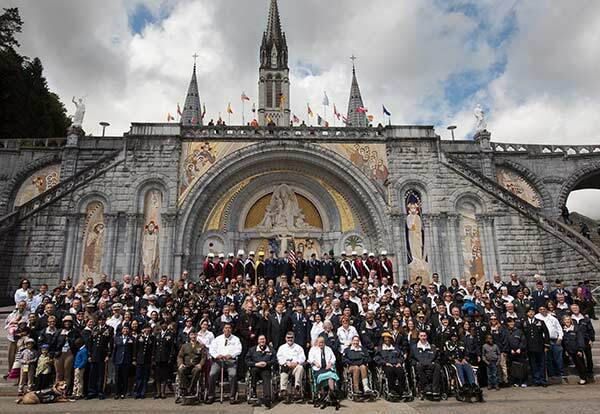 ‘Wounded Warriors’ supported by the Knights and the Archdiocese for the Military Services, join thousands of international military pilgrims for the annual pilgrimage at French Marian shrine to offer peace to wounded, ill and injured. More than 200 active and retired U.S. military personnel will take part in the annual Warriors to Lourdes spiritual journey dedicated to individual healing and a more peaceful world. The May 15-22 journey is timed to coincide with the 60th annual International Military Pilgrimage (PMI). ‘The Marian Shrine at Lourdes is a place of hope where healings of many types take place, both physical and spiritual,’ said Supreme Knight Carl Anderson. The visit to Lourdes is organized by the Archdiocese for the Military Services, USA (AMS) and supported by the Knights of Columbus. The PMI draws tens of thousands of troops, veterans, and others from around the world to the famous shrine to the Blessed Virgin Mary. The theme for this year’s PMI is Pacem in Terris (Peace on Earth). Archbishop Timothy P. Broglio urged the pilgrims to pray ‘or progress in international dialogue, welcome for the immigrant, and a decrease in violence in our communities and the world.’ The PMI will include an international opening ceremony and events with the color guards of many countries in attendance. The pilgrims will also have daily Mass, times of reflection and reconciliation and have the opportunity to bathe in the waters of Lourdes from which many seek spiritual, physical or emotional healing. Follow the link on www.IWKnights.com/bulletin or at facebook.com/IWknights 9981 and NOW on Twitter at twitter.com/IwKnights to read the entire article which was published on http://www.kofc.org. The PMI draws tens of thousands of troops, veterans, and others from around the world to the famous shrine to the Blessed Virgin Mary.